How is Sergei Skripal connected to Russiagate? RussiaGate was a criminal conspiracy by the Obama administration, the Clinton campaign, and the Deep State to steal the US presidential elections of 2016 and prevent the Trump presidency, thus enabling the continuation of the US covert war on Syria and the preparation of a war on Russia. 1 Is Russia the enemy? 2 Did Russia Elect Trump? 3.1 Is there a 'Deep State'? 5.4 Who else was involved in creating the dossier? 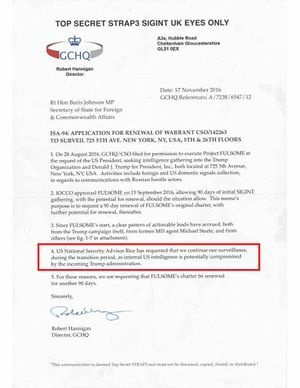 6 Did GCHQ spy on Trump Tower? The Democrats should do everything they can to tie the Republicans to something most sane people would agree, even if they are hopelessly polarized, is an indisputable threat to the United States—Russia. I think Russia is a solution to political polarization. The Democrats should and must start using Russia as a way to break through the vicious cycle consuming the parties, Washington, and the whole country. Russia is our enemy. This is a fact. It attacked our presidential election. It continues to attack us in what is emerging as a new Cold cyberwar. In tying the Republicans to an enemy, the Democrats have the potential to break the Republicans. Do they stand with America or do they stand with Russia? The best part is that the Democrats do not have to lie, distort or otherwise misrepresent reality to make the case." This profound split in the Deep State has now broken into open warfare. 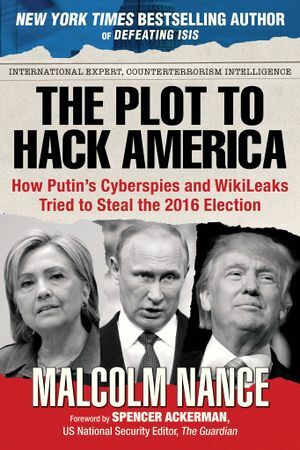 The first salvo was the absurd propaganda campaign led by Establishment mouthpieces The New York Times and The Washington Post claiming Russian agents had "hacked" the U.S. election to favor Trump. This fact-free propaganda campaign failed--having no evidence didn't work quite as well as the NYT and Wapo expected-- and so the propaganda machine launched the second salvo, accusing Trump of being a Russian patsy. Is there a 'Deep State'? Alleged information is allegedly gained via some low-level staff or 'trusted compatriots, 'confidants' talking to high ranking officials (note the level of funding compared to level of sourcing). When I broke the story in October, I spoke with him. Here’s what he said. The Steele Dossier is the “least bad” option to justify the origin of the DOJ/FBI “Trump Operation”. However, what if the Steele Dossier is the finished product of the DOJ/FBI “Trump Operation”, not the beginning of an investigation? pp 34-35 , p18 (20 Oct) and several other places Trump's representative Michael Cohen met in Prague with Kremlin representatives and hackers. Michael Cohen denies being in Prague, even after his plea deal with prosecution. pp 25-26. Allegations about Russian oligarchs Fridman, Aven, Khan being close to Putin, and have compromising material about Putin early days. Fridman, Aven and Khan are suing for defamation and damages (links below). Those allegations are serious; sources of those allegations are not publicly disclosed. p 13 (Aug 5) and elsewhere, 'Peskov' leading interference, Ivanov against. After Ivanov sacked, pp 22-24, 14 Sept, p. 32, 19 Oct. and elsewhere, 'Ivanov' 'nominated' to be responsible. p 28, 12 Oct, FM ->FSB ->presidential administration time-sequence of responsibilities alleged. Cohen still denies being in Czech republic, despite claims that his phone was turned on. A British tabloid raises phone cloning theory (Daily Mail, December 27, 2018). 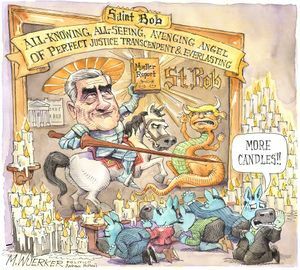 Jennifer Taub Replying to @MichaelCohen212 Quick follow up if I may. Have you ever been to any location within the Czech Republic? Asking for several hundred million friends. Over a career that spanned more than 20 years, Steele performed a series of roles, but always appeared to be drawn back to Russia; he was, sources say, head of MI6’s Russia desk. 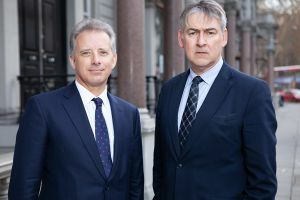 When the agency was plunged into panic over the poisoning of its agent Alexander Litvinenko in 2006, the then chief, Sir John Scarlett, needed a trusted senior officer to plot a way through the minefield ahead – so he turned to Steele. It was Steele, sources say, who correctly and quickly realised that Litvinenko’s death was a Russian state “hit”. The wealthy investor (Bill Browder), who renounced his US citizenship in 1998, has since characterized Fusion's work for BakerHostetler as a "smear campaign" against him and Magnitsky carried out "in advance of congressional hearings on the Global Magnitsky Act." Fusion has denied that its opposition research against Browder on behalf of BakerHostetler was an effort to undermine the Magnitsky Act, and has insisted that Veselnitskaya's lobbying activities against Magnitsky were separate from the Prevezon proceedings. Oleg Deripaska in his Daily Caller op-ed piece talks about Fusion GPS in particular. (Russian oligarchs) "Mikhail Fridman, Petr Aven, and German Khan v. Orbis Business Intelligence Limited and Christopher Steele" , Superior Court, District of Columbia, USA (December 12, 2017)(April 16, 2018). The case was dismissed, on the First Amendment grounds, in August, 2018, and appealed in December, 2018 (below). Who else was involved in creating the dossier? 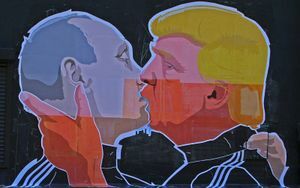 Over the past few months, many questions have been raised regarding the ‘mysterious Maltese Professor,’ Joseph Mifsud, and his involvement in the Trump – Russia saga. Disobedient Media broke coverage of Joseph Mifsud’s connections to UK intelligence, as well as the connection of Russiagate’s central ‘witnesses’ to British Intelligence. Disobedient Media was also the first outlet to report on the findings of UK political analyst Chris Blackburn, who recounted evidence that included reference to Joseph Mifsud’s close relationship with Italian Senator Gianni Pittella. See also Sergei Skripal#Joseph Mifsud/Russiagate connections? Did GCHQ spy on Trump Tower? where he states: “the audience of this document should not be limited to Members of Congress — the American people deserve to know the information it contains.” (FWIW). Eliason sees the election campaign for Hillary as an extension of the ongoing cyberwar operation against Russia. The two sources that originated the allegations claiming that Russia meddled in the 2016 election — without providing convincing evidence — were both paid for by the Democratic National Committee, and in one instance also by the Clinton campaign: the Steele dossier and the CrowdStrike analysis of the DNC servers. The Fusion GPS dossier was one of the dirtiest political tricks in U.S. history. 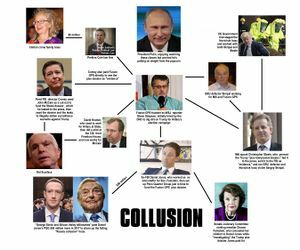 In essence, the Clinton’s created the Russian “angle” out of thin air; and the FBI and DOJ used that creation as the legal underpinning for the counterintelligence operation. The cointel op was always just a ruse for wiretapping, surveillance and monitoring of Donald Trump campaign officials. The inner circle of the Obama Administration plotted an "insurance policy". They saw it coming -- that is, an offensive rogue disrupter who was soft on Russia, to boot -- and out of that alarm the entire hoax of RussiaGate was born. 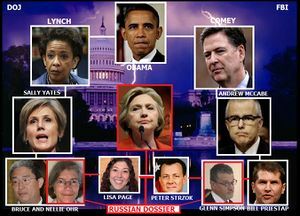 As is now well known from the recent dump of 375 Strzok/Gates text messages, there occurred on August 15, 2016 a meeting in the office of FBI Deputy Director Andrew McCabe to kick off the RussiaGate campaign. February 2, 2018: FISA abuse memo released. This new evidence culminates in the ground-breaking conclusion that the UK and its intelligence apparatus may be responsible for the invention of key pillars of the Trump-Russia scandal. If true, this would essentially turn the entire RussiaGate debacle on its head. 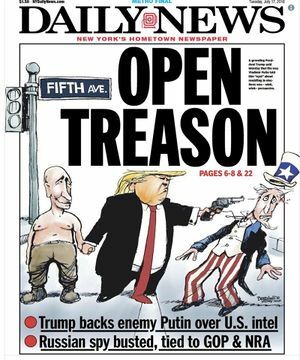 As Trump won primary after primary in 2016, a rattled John Brennan started claiming to colleagues at the CIA that Estonia’s intelligence agency had alerted him to an intercepted phone call suggesting Putin was pouring money into the Trump campaign. The tip was bogus, but Brennan bit on it with opportunistic relish. The bridge to the Russia investigation wasn’t erected in Moscow during the summer of the 2016 election. It originated earlier, 1,700 miles away in London, where foreign figures contacted Trump campaign advisers and provided the FBI with hearsay allegations of Trump-Russia collusion, bureau documents and interviews of government insiders reveal. These contacts in spring 2016 — some from trusted intelligence sources, others from Hillary Clinton supporters — occurred well before FBI headquarters authorized an official counterintelligence investigation on July 31, 2016. Earlier Bruce Ohr testimony. What Bruce Ohr Told the FBI -WSJ, January 17, 2017. Everybody knew. Everybody of consequence at the Federal Bureau of Investigation and Justice Department understood fully in the middle of 2016—as the FBI embarked on its counterintelligence probe of Donald Trump—that it was doing so based on disinformation provided by Hillary Clinton’s campaign. That’s the big revelation from the transcript of the testimony Justice Department official Bruce Ohr gave Congress in August. (Under paywall, more bits on zerohedge). The conspiracy against Donald Trump, in my opinion, originated with British intelligence and persons connected with the Clinton Campaign. The provocation/dangle of George Papodopolous was the result of electronic intercepts by GCHQ targeting people working on the Trump campaign. The collection effort generated hundreds of highly classified "SIGINT" messages that were disseminated in the U.S. intelligence community. Addresses for the most part various false media reporting. Does not discuss details of the redacted full Muller report (released at about the same time), but discusses same main claims in the end. This page was last edited on 20 April 2019, at 23:07.